Vatican City: Pope Benedict indicated on Thursday he would withdraw into isolation, away from public sight after his resignation at the end of the month. "Even if I am withdrawing into prayer, I will always be close to all of you and I am sure that you will be close to me, even if I remain hidden to the world," he said in unscripted remarks to priests from the diocese of Rome, in his capacity as bishop of the Italian capital. 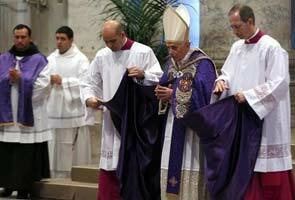 Former Pope Benedict Says He Is Ready For Final "Pilgrimage"